When you’re hungry, you’re hungry, and sometimes that means tearing off the patch of green mold growing on a slice of bread in order to make yourself a sandwich. But is this really getting rid of the mold, or should you consider the entire slice a goner when even just a little fuzz shows up on the surface? According to the experts: Prepare to throw out everything in your pantry. 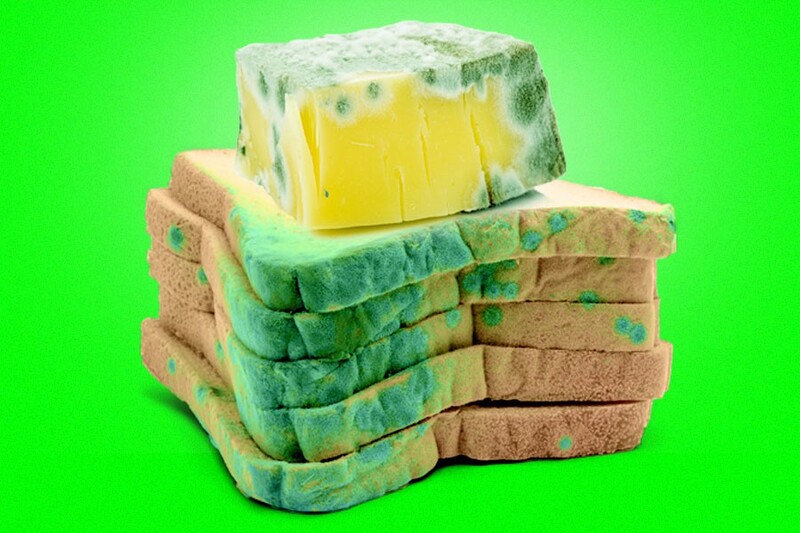 Those green (possibly furry) patches on the surface of bread, cheese or old fruit are spores that allow the mold to reproduce, but like plants, mold has roots and branches called hyphae, which are tough to see and oftentimes burrow much deeper into the food. This means slicing off the colorful spores growing on the outside of the food won’t save you from eating a bunch of fungus. That said, you also don’t need to run to the emergency room if you’ve ever eaten a chunk of cheese after chopping off just the moldy bit, as you’ll more than likely digest it in the same way you would any other food so long as you have even a functioning immune system. It’s also worth noting that tougher foods—like hard cheeses, salamis and vegetables such as carrots, bell peppers and cabbage—are more salvageable than others, since those moldy roots we mentioned earlier have a tougher time digging through their hard surfaces. Soft fruits, lunch meats and jams, however, aren’t quite so resilient. Securely cover foods in the fridge (with plastic wrap or Tupperware). Eat all leftovers within four days. Don’t leave perishable food out for more than two hours. Alternatively, dramatically increase your sandwich intake to ensure that no necessary materials are left sitting on the counter (or in the refrigerator) for too long.